Unfortunately, many children suffer from serious,potentially painful dental diseases. Unlike other illnesses, dental diseases don't go away on their own. When treatment is required for serious dental conditions,local anesthesia is recommended to make delivery of that required treatment possible in a safe and comfortable manner. This will numb the side of the mouth where the anesthesia is administered, and the child will feel no pain thereafter. When a child (or a person of any age with a disability)needs extensive dental treatment, general anesthesia is an accepted standard of care. This standard is supported by the American Academy of Pediatric Dentistry, the American Dental Association, the American Medical Association,and the U.S. Department of Health and Human Services. 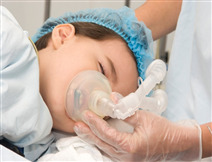 General anesthesia is also an accepted standard of care for situations involving children who have limited comprehension or children who are extremely uncooperative and require dental care that is technically difficult or sensitive to deliver.